Pennsylvania hosts several schools with quality online programs. The Pennsylvania school with the most success in online learning is undoubtedly Penn State. The school's World Campus is internationally renowned for its extensive offerings and excellent instructors, and more than 150 graduate degrees, undergraduate degrees, certificates and minors. Programs cover a wide array of disciplines, from business and psychology to media studies and turfgrass science. The state is also home to several other schools with similarly robust online programs and services. But before we look at the best online colleges in Pennsylvania, let's consider how both higher education and online education are faring in the state today. Pennsylvania’s robust public university system and extensive private school options place it among the best states in the country to pursue higher education. The state boasts 256 degree-granting postsecondary institutions, according to 2015-2016 data from the National Center for Education Statistics. This figure includes 62 public, 120 nonprofit, and 74 for-profit institutions. Combined, these colleges and universities served 725,770 enrolled students in fall 2016, an increase of about 116,000 students since 2000. These numbers continue to grow annually. According to College Board data, the average yearly in-state tuition for a Pennsylvania public school was $14,437 in 2017. At Penn State University Park, the state’s flagship university, in-state students currently pay $18,436 per year, while out-of-state students pay $33,664. The Ivy League school serves nearly 47,000 undergraduate and graduate students through its on-campus and online programs. Students attending online colleges in Pennsylvania can access several lucrative financial aid opportunities. In the 2015-2016 school year, postsecondary students in Pennsylvania received a total of $474,259,691 in need-based and non-need-based grants. Common sources of financial assistance include the Pennsylvania State Grant Program, PA Targeted Industry Program, Education Assistance Program for National Guard Members, work-study programs, and various institutional assistance grants. These grants go to more than 215,000 college and university students each year. The Distance Education State Almanac reports that 180,730 (or 24%) of Pennsylvania’s college and university students took at least one online course in in the 2015-2016 school year. While this is slightly lower than the national rate of 29%, distance learning increased by more than 31% between 2012 and 2015. Furthermore, 85,178 (about 11.3%) of postsecondary students took all of their courses through distance education. This number includes 56,876 undergraduate and 28,302 graduate students. Approximately 51.7% of these students lived in Pennsylvania, while the the rest lived out of state. The data also indicates that about 95,552 (12.6%) of the state’s postsecondary students took a mix of on-campus and online courses during the 2015-2016 school year. The online schools in Pennsylvania with the most significant growth between 2012 and 2015 include Penn State’s World Campus, Drexel University, Temple University, and Harrisburg University of Science and Technology. Two organizations stand out for their efforts to promote the state’s online postsecondary courses and programs: PA Universities Online and the Pennsylvania Distance Learning Association (PADLA). PA Universities Online is essentially a tool for finding online colleges in PA. Programs and courses are currently available at the 14 state universities, collectively referred to as the PA State System of Higher Education. This service makes it easy for students enrolled in one state school to secure courses at a sister school. Similarly, it lets students from outside the state network audit courses unique to PA state schools. The PADLA is a 501c3 nonprofit whose mission is to provide a destination for information, networking and knowledge regarding distance education. Geared toward the professionals responsible for delivering online courses, whether they be teachers or administrators, the PADLA works with every form of online learning, including adult basic education, workplace training, ESL courses and naturalization test prep. The organization is, in a sense, an ongoing meeting of the minds shaping online education, which in turn benefits PA students at all levels. Students attending online colleges in PA benefit from the State Authorization Reciprocity Agreement (SARA), which sets uniform standards for distance education programs. SARA helps colleges and universities navigate the different laws and regulations governing online learning in each individual state. By joining SARA, online schools in PA can significantly reduce costs and pass on savings to their students. Colleges can also offer lower fees to residents of other SARA states. Pennsylvania became an official SARA member state in January 2017. While not a member of any of the four regional compacts within the the agreement, Pennsylvania is affiliated with the Southern Regional Education Board. There are now hundreds of SARA-approved postsecondary institutions across the United States. Distance learners benefit from SARA through greater access to online courses and reduced tuition rates. The compact also aims to improve the quality of distance learning by setting universal standards. SARA is currently working to streamline the process for resolving complaints from students attending schools in SARA states. As online programs continue to grow in popularity, SARA will likely play an increasingly important role in ensuring students get the quality education from distance programs. Below, you will find our rankings of the best online four-year programs in Pennsylvania. Our profiles look at how schools approach online education and then list out their services for distance students and their popular, fully online degrees. After reviewing the best online schools in PA, explore our state resources, including a database of every college and university in Pennsylvania or our index of popular in-state scholarships. Founded in 1842, Villanova University embraces the Catholic tradition with a liberal arts education and an emphasis on spiritual well-being. The school hosts more than 10,000 undergraduate, graduate, and professional students on its Villanova, PA campus and online communities. Villanova's online undergraduate programs are designed for adult learners, nontraditional students, and those looking to complete their degree using previous college credit. Online undergraduate programs include interdisciplinary studies, leadership studies, and public service and administration. Students must be at least 22 years old and have a minimum of 15 college credits to enroll. Villanova's online non-credit professional development programs provide opportunities for managers and business professionals to gain advanced knowledge in organizational leadership, human resources, business intelligence, and agile project management. Online graduate programs at Villanova include numerous master's degree options. The school's online master's degrees in business administration feature concentrations in finance, marketing, analytics, strategic management, and international business. Villanova also offers business master's degree programs in taxation, church management, and analytics, along with a master of law in taxation. Those looking for something less than a full graduate degree can complete graduate certificate programs in estate planning, employee benefits, and state and local taxation. The online engineering graduate program at Villanova features concentrations in biochemical, chemical, civil, mechanical, and electrical engineering. Students can further specialize in topics like cybersecurity, computer engineering, sustainability, or environmental engineering. Available graduate certificates in engineering allow learners to dive deeper into topics like machinery dynamics and thermofluid systems. Villanova also offers online doctoral programs in nursing, such as a doctor of nursing practice (DNP) or a Ph.D. in nursing education. Both programs offer practicing nurses coursework that is directly applicable to patient care and working with their peers. Students can complete the online doctoral programs in nursing on a full- or part-time basis, and coursework is done via distance learning and evening sessions. Villanova maintains accreditation through the Middle States Commission on Higher Education. The M. Louise Fitzpatrick College of Nursing at Villanova has approval through the State Board of Nursing of the Commonwealth of Pennsylvania, while doctoral programs are accredited Commission on Collegiate Nursing Education. Business programs are accredited by the Association to Advance Collegiate Schools of Business. With two campuses near Pittsburgh, Chatham University provides students educational excellence and nationally recognized sustainability initiatives. The school's main Shadyside campus embodies the historic traditions of Chatham while providing modern amenities and innovative academic programs. Chatham's Eden Hall campus houses the first academic community dedicated to environmental and sustainability learning, living, and development. Online programs at Chatham University include undergraduate degree completion programs in business administration, nursing, and psychology. Chatham also offers a Pathways to Nursing degree, in which learners earn a bachelor's degree, obtain a registered nursing license, and work for a year in the field. Online master's degrees in nursing provide practitioners convenient coursework to supplement their current careers. Learners can enroll in Chatham's online BSN-to-DNP executive track, which confers two graduate degrees through 53 credits of coursework and 1,000 hours of practical experience. The online doctorate of nursing practice prepares nurses for executive positions in the field; students complete 27 credits of coursework, 500 hours of clinical experience, and one on-campus residency. Chatham offers additional online master's programs in healthcare informatics, business administration, professional writing, and interior architecture, where working professionals can apply an advanced education to their current careers. Chatham's low residency master of fine arts in creative writing includes two residencies to supplement online coursework. Chatham University provides licensed occupational therapists two paths to a doctoral degree. Occupational therapists without a master's degree can enroll in Chatham's bridge program to complete nine hours of prerequisite coursework prior to beginning the 16-month cohort-based program. Occupational therapists with a master's degree enroll directly in Chatham's online doctorate in occupational therapy. Chatham University holds accreditation through the Middle States Commission on Higher Education. Programmatic accreditations include the approval by the Commission on Collegiate Nursing Education and the International Assembly for Collegiate Business Education. Through online and hybrid programs, the Pennsylvania College of Health Sciences continues its original mission of providing quality nursing and health-centered degrees. Founded in 1893 as a nursing school, PA College promotes excellence in healthcare and provides learners the knowledge and leadership skills to succeed in the field. PA College offers an online bachelor's in nursing degree for registered nurses to complete their undergraduate training, while an online certificate program at PA College includes an 18-credit healthcare administration certification. Both programs provide clinical professionals expertise in healthcare policy, practice, and regulations directly applicable to their work within the industry. All of PA College's online master's degrees integrate online coursework and weekend residencies. Students can choose from programs in healthcare administration, nursing administration, or nursing education. Each requires 33 credits of coursework and a practical experience. The healthcare administration master's program trains healthcare professionals in advanced healthcare policy, practice, and research, and builds competencies in human resources, leadership, and organizational behavior. The online nursing administration and education programs develop managerial and instruction skills, respectively, and practicing nurses improve their collaboration and communication with their peers. Nursing administration students focus on strategic planning, organizational behavior, and business aspects of the nursing field. Conversely, nursing education learners explore principles of curriculum development, teaching strategies, and practical integration. Students can also pursue a hybrid doctorate in nursing practice at PA College. The program blends online coursework with face-to-face exercises, while students balance interdisciplinary content and practical experience. Learners can complete the curriculum in two, three, or four years depending on their previous education, and whether they pursue the degree full or part time. PA College is accredited by the Middle States Commission on Higher Education. Nursing programs hold accreditation through the Commission on Collegiate Nursing Education. Duquesne University, founded in Pittsburgh in 1878, advances its Catholic heritage through service to the church and dedication to spiritual values. Duquesne emphasizes partnerships between laity and religious communities, and embraces diversity, ethical growth, and academic excellence. Through online bachelor's degree programs in nursing, computer systems technology, and organizational leadership, Duquesne offers learners flexible degree options. The online RN-to-BSN program provides students a customized degree plan based on their background, experience, and future professional goals. Duquesne's online master's programs include master's of science degrees in management and sports business, along with a hybrid supply chain management degree. Online programs in instructional technology and higher education administration allow practicing teachers and school administrators to build practical, analytical skills for their current positions. Duquesne also offers an online Ed.D. in education, and a Ed.D. in instructional technology and leadership. The school offers three online graduate nursing programs with a focus on forensic nursing, nursing education, or lifespan nursing practice. Duquesne's online doctoral programs in nursing, nursing ethics, and nursing practice require four years of coursework and a residency. Duquesne University's Online Campus provides learners with numerous resources throughout their degree, such as a writing center, library, and career. Additionally, online tutorials prepare students for their assignments, activities, and interactions during coursework. Duquesne University also provides extensive information to military and veteran students who want to pursue online, hybrid, and certificate programs. Duquesne University is accredited by the Middle States Commission on Higher Education. Nursing programs maintain accreditation by the Commission on Collegiate Nursing Education and the Nursing School holds designation as a Center of Excellence in Enhancing Student Learning and Professional Development by the National League for Nursing. Founded by Philadelphia financier and philanthropist Anthony J. Drexel in 1891, Drexel University is dedicated to innovation and cooperative educational programming. The school fosters academic research and synergistic teaching at its five campuses in the Philadelphia region. Drexel offers online undergraduate degrees in business, behavioral health counseling, communication, and nursing. Undergraduate learners complete coursework in four years, with accelerated timeframes available for students with transfer credits. Drexel's online cybersecurity degree explores data security and maintenance, while an online general studies program features interdisciplinary coursework in which students can tailor their degree to meet their interests and goals. Students can choose from seventeen online master's degrees in business and management, as well as programs in television, nonprofit, and construction management. The school's online master's degrees in education include concentrations in special education, international education, higher education, and teaching, each building competencies in subsets of the field for educators to advance their careers. Similarly, online master's degrees in technology, medicine, nursing, and research each offer specializations for students looking to develop expertise on more specific topics. Drexel's online doctoral programs in nursing practice, health science, and educational leadership and management require 45-62 credits. Each program includes clinical requirements and dissertations that build advanced research and communication skills. Drexel also offers 48 online professional development and continuing education certificates that give learners the opportunity stay current on trends in their field and build new competencies. Drexel University maintains accreditation through the Middle States Commission on Higher Education. The school also holds 32 programmatic accreditations and participates in the State Authorization Reciprocity Agreement for its online programs. Founded in the 1780s, Saint Joseph's University in Philadelphia is a liberal arts institution grounded in the Jesuit tradition. SJU offers more than 55 undergraduate majors, 52 graduate programs, and over 30 online programs and certificates. Students in SJU's online bachelor's degree in liberal studies can transfer as many as 75 credits. The degree features two concentrations that can be completed in under three years. The school also offers an autism behavioral studies major, in which students take 30 credits in autism theories, therapies, and treatments as they prepare for the Board Certified Assistant Behavior Analyst (BCaBA) exam. Additionally, students can pursue a professional studies track that includes coursework in motivational strategies, leadership, communication, and organizational structure. Learners can choose from one of several degree completion programs in business administration, organizational leadership, and psychological studies. These programs require degree seekers to transfer up to 75 credits, and then complete at least 45 credits at SJU, including 12 upper division credits. Master's degrees at SJU include special education and educational leadership, which are designed for teachers and educational professionals who want to cultivate practical knowledge and skills to use in the field. Additional master's programs at SJU include online degrees in criminal justice, healthcare administration, organizational development and leadership, and human resource management. A master's in business intelligence features optional concentrations in cyber analytics, data analytics, general business, or programming languages. Regardless of the program, learners complete coursework in 2-3 years. Certificates in business administration and autism studies accompany other graduate certificates in areas such as behavioral analysis and instructional technology. Similarly, education professionals can earn certificates in special education, reading, and English as a second language to support their professional development or to supplement their SJU degree. SJU is accredited by the Middle States Commission on Higher Education. Additional accreditations include the Pennsylvania Department of Education and the Association to Advance Collegiate Schools of Business. Founded in 1998, the Pennsylvania State University World Campus provides learners with convenient, accessible career-enhancing programs. Students can choose from over 150 accredited undergraduate, graduate, and certificate programs. Students can pursue one of seven associate degrees: an associate of arts in letters, arts, and sciences; or an online associate of science degrees in business administration, criminal justice, human development, information sciences and technology, labor and employment relations, and turfgrass science and management. The school's 35 online bachelor's degrees include subjects like strategic communication, economics, marketing, or political science. Coursework blends field-specific theories with practices and research, while courses last between 12-15 weeks. Students interact with their peers and instructors via Skype, email, and the Blackboard Learning Management System. Students at Penn State World Campus can also choose from over 50 master's degrees and one online doctorate. Master's programs in professional studies include seven homeland security degrees, and teachers can pursue online master's degrees in special education, adult education, or curriculum and instruction. Other online master's degrees include finance, public administration, engineering, or nursing. Programs require 30-52 credits of coursework. Optional graduate certificates can supplement master's degrees and allow working professionals to apply new knowledge and skills directly to their current roles. The online doctorate in nursing practice requires 61 credits for nurses with bachelor's degrees, or 38-46 credits for learners who hold a master's degree in nursing. Students complete an evidence-based project to round out the degree. Penn State World Campus is accredited by the Middle States Commission on Higher Education. Penn State World Campus' Doctor of Nursing Practice program is accredited by the Commission on Collegiate Nursing Education and approved by the Pennsylvania State Board of Nursing. Founded as a teaching college in 1889, Slippery Rock University of Pennsylvania offers undergraduate and graduate programs to more than 8,500 students through online and on-campus programming. Based in Slippery Rock, SRU features more than 20 online undergraduate degree completion programs, graduate degrees, and certificate programs. SRU's degree completion programs are designed for learners with an associate degree or more than 60 hours of college coursework. The online bachelor's degree completion programs include leadership studies, nursing, management, philanthropy and nonprofit management, and liberal arts. The interdisciplinary nature of each program means that students can transfer previous college coursework, and structure a degree that meets their personal and professional goals. SRU offers online master's degrees in history, data analytics, park resource management, and criminal justice. Each program requires 30-33 credits of coursework and can be completed in 1-2 years. SRU's online master's degrees in special education include specializations in autism and supervision, while secondary education master's degrees allow learners to focus on English, history, or math and science education. SRUl also provides education degrees in environmental education, early childhood education, and technology for online instruction. The online doctorate in special education prepares teachers, school administrators, and health service workers as leaders in the field of special education. Learners complete 12 credits of research-based coursework, 18 credits of leadership training, and 15 credits of special education core classes. Students then finish with a 15-credit research and dissertation sequence. SRU also offers a 12-credit online certificate for educators who want to teach online, along with a 12-credit certificate in applied research, statistics, and measurement. Learners can complete also complete SRU's 12-credit online special education teaching endorsement. SRU maintains accreditation through the Middle States Commission on Higher Education. SRU's education degrees are programmatically accredited by the Council for the Accreditation of Educator Preparation and the Pennsylvania Department of Education. Business programs are accredited by Accreditation Council for Business Schools and Programs. Cedar Crest College in Allentown sits on 84 acres of land designated as a national arboretum. Founded in 1867, Cedar Crest hosts more than 1,600 students on its scenic campus and its online programs. Cedar Crest College offers an online bachelor's degree in business administration with concentrations available in economics, health care management, human resource management, general management, or marketing. Students can also complete online certificates in health care management and human resource management, which allows graduates to demonstrate their expertise in the field. The online nursing degree at Cedar Crest College provides nurses convenient and flexible coursework to earn their bachelor's degree. Learners must have a registered nursing license, an accredited associate degree or certificate with a minimum 2.5 GPA, and a requisite number of clinical hours for admission. The school also offers an online master's degree in education with an emphasis on the art of teaching. The program trains teachers to master their classroom and instructional techniques, and emphasizes educational policies, procedures, and processes at local, state, and national levels. Learners can complete either a thesis or non-thesis track, and finish their degree in 2-5 years. In conjunction with the Online Consortium of Independent Colleges and Universities (OCICU), Cedar Crest College offers more than 500 college classes in convenient and accelerated formats. Classes last eight weeks and meet the requirements for many of Cedar Crest College's degree programs. Through Cedar Crest College's School of Adult and Graduate Education (SAGE), adult learners can earn more than 50 on-campus, hybrid, or online certificates. Cedar Crest College is accredited by the Middle States Commission on Higher Education. Nursing programs hold accreditation through the Accreditation Commission for Education in Nursing. Located in Dallas, Misericordia University carries out a commitment to its Catholic values through academic excellence and community engagement. Mercy, justice, hospitality, and service form the core of Misericordia's mission as the school fosters intellectual curiosity, critical thinking, and global respect. Misericordia offers online bachelor's degrees in social work, professional studies, information technology, accounting, and business administration. Registered nurses can complete Misericordia's online RN-to-BSN degree, while registered respiratory therapists can also pursue a four-year degree in health science. Additional online bachelor's programs in business administration and healthcare management provide entry- and mid-level professionals advanced coursework to build managerial skills and leadership potential. All of Misericordia's online bachelor's programs require 120-126 credits, but adult learners and working professionals can transfer previous coursework to accelerate degree completion. Undergraduate certificate programs online at Misericordia augment degree programs and professional experiences. Learners can complete a 16- or 18-credit certificate in patient navigation, addictions counseling, diagnostic medical sonography, and picture archiving and communications systems administration. Students can also pursue a master's in business administration online with specializations in general management, healthcare management, accounting, or human resource management. The online master's of science in organizational management offers business professionals training in leadership within for-profit and nonprofit organizations. Both programs require 36 credits. Misericordia's online nursing master's degree combines coursework and practical experience to train nurses for advanced-practice roles in the field. A doctoral degree in nursing similarly incorporates clinical and practical knowledge, while also preparing nurses for leadership positions in nursing organizations and institutions. Learners entering the nursing doctoral program with a master's degree in nursing complete 27 credit hours; nurses with a bachelor's degree take 64 credit hours of classes. Misericordia also offers an online doctorate in occupational therapy. Misericordia maintains accreditation through the Middle States Commission on Higher Education. Programmatic accreditations include the Commission on Collegiate Nursing Education and the International Assembly for Collegiate Business Education. DeSales University emphasizes charity, humanism, and faith in its Center Valley campus and online programs. Grounded in the spirituality of St. Francis de Sales, DeSales University in expresses its Catholic identity through service to the poor, cultural dialogue, and dedication to academic excellence. Online bachelor's programs at DeSales University provide adult learners numerous accelerated options for degree completion. Programs require 120 credits, but learners can transfer up to 75 credits to earn their degree. Bachelor's degrees are available in business administration and general marketing, or in niche areas such as pharmaceutical marketing and financial planning. DeSales' accelerated online criminal justice degrees offers students two specializations in intelligence and rehabilitation: the former trains learners to investigate, analyze, and assess intelligence information, while the latter prepares graduates to pursue criminal treatment and counseling within the criminal justice system. The accelerated online psychology program includes three concentrations in clinical counseling, experimental research, or forensic psychology. Students can also earn a general management degree, or specialize in supply chain management or human resource management. Undergraduate certification programs online at DeSales require 18 credits of coursework, and feature topics in business administration, marketing, or personal finance. Online certificates in management and leadership, financial management, and human resource management prepare business professionals for administrative and executive roles. Students can also pursue an online undergraduate degree and an online certificate in theology. The online theological programs explore scripture, the ministry, and doctrine, and train learners to incorporate faith and reason into their personal and professional lives. DeSales University holds accreditation through the Middle States Commission on Higher Education. The business programs are accredited by the Accreditation Council for Business Schools and Programs. California University of Pennsylvania offers more than 75 online programs to its 7,300 students. Degrees are available across fields like education and human services, liberal arts, science and technology, and graduate studies and research. Cal U offers online associate degrees liberal studies, technical studies, and applied policing and technology. Learners can also earn an online bachelor's degree in liberal studies or in fields such as computer information systems, criminal justice, sociology, or science and technology multidisciplinary studies. Additional online bachelor's programs in jurisprudence, nursing, exercise science, and Arabic language and cultures provide learners with a breadth of degree options. Education professionals can complete an online master's programs in secondary education and teaching or administrative leadership. Teachers can also earn an online master's degree with several special education subspecialties, educational leadership, or English as a second language. Online business master's degrees offer working professionals advanced concentrations in business analytics, entrepreneurship, healthcare management, and nursing administration. Additional programs include master's degrees in legal studies, exercise science, and sports management. The school offers online doctoral programs in criminal justice, health science, and education. Students can complete the online doctorate in criminal justice in two years. Additionally, more than 40 undergraduate and graduate certificates and licenses are also available through online coursework. Cal U is accredited by the Middle States Commission on Higher Education. Programmatic accreditations include Accreditation Board for Engineering and Technology, the Commission on Collegiate Nursing Education, and the National Council for Accreditation of Teacher Education. As the first Franciscan university in the United States, Saint Francis University maintains its Catholic mission through academic programs grounded in personal and professional ethics, service to others, and experiential learning. Located in Loretto with satellite offerings around the state, SFU provides online certificate, undergraduate, and graduate programs to students of all ages. SFU offers an online endorsement in autism spectrum disorders to education and health service professionals who want to expand their career competencies. Students complete 12 credit hours of coursework and 80 field experience hours. The online business certificate prepares individuals with little or no business experience for an associate or bachelor’s degree in the field. Students can apply credits from the online business certificate to one of SFU’s undergraduate business degrees. The university offers online associate and bachelor’s degrees in business through the adult degree and continuing studies (ADCS) program. ADCS degrees and programs provide generous transfer options and accelerated formats for students who work full time. Students can also enroll in an online associate degree in human resource and computer technology, health professions technology, or engineering and mechanical technology. Bachelor’s programs include organizational leadership, health science, and computer science management degrees. Many of SFU’s online undergraduate degrees include degree completion options for students who have previous college coursework. SFU offers four graduate degrees online. Students in SFU’s online master’s in business administration and master of human resource management programs complete coursework through SFU’s Shields School of Business. SFU’s online master’s in health science and medical science consist of 30 and 33 credit hours respectively. Students can complete the programs in one to two years. SFU is accredited by the Middle States Commission on Higher Education. The Shields School of Business holds accreditation through the International Assembly for Collegiate Business Education, and the human resource management program maintains approval through the Society for Human Resource Management. Temple University consists of 20 colleges and schools, and offers more than 500 academic programs. Founded by an ordained Baptist minister in 1882, Temple University became an incorporated university in 1907 and currently ranks among the top research institutions in the nation. Online programs at Temple include certificates and noncredit courses, as well as undergraduate and graduate programs. Students can earn online graduate certificates in strategic communication and leadership or conflict management and dispute resolution through Temple’s Klein College of Media and Communication. Online graduate certificates in eleven pharmacy subspecialties accompany health informatics and sports management certificate programs. Temple offers online bachelor’s and master’s degrees in business administration through the Fox School of Business. Business professionals can also earn online master’s degrees in sports business, human resource management, communication management, or digital innovation in marketing. Online master’s degrees in health informatics accompany two public health master’s degrees, which are ideal for healthcare and clinical health providers alike. Through online public health master’s degrees in health policy and management or social and behavioral sciences, students advance their knowledge and skills in assisting vulnerable populations through health-related programs and healthcare initiatives. Temple also offers online master’s degrees in social work, music education, travel and tourism, and regulatory affairs. Temple’s online doctorate programs in athletic training and occupational therapy consist of 36 and 31 credit hours respectively. Temple’s online doctorate in athletic training includes six-week and 15-week asynchronous and synchronous coursework to build evidence-based techniques and decision-making skills among certified athletic trainers. During the online occupational therapy doctorate, students complete 22 credit hours of required coursework, nine elective hours, and 160 hours (or four weeks) of clinical training. Students can earn a doctorate in occupational therapy in two years. Temple University maintains accreditation through the Middle States Commission on Higher Education. Temple’s Fox School of Business is accredited by the Association to Advance Collegiate Schools of Business, and the College of Public Health holds accreditation through the Council on Education for Public Health. Thomas Jefferson University, founded in 1824, and Philadelphia University, founded in 1884, merged in 2017. Philadelphia University + Thomas Jefferson University, better known as Jefferson, emphasizes interdisciplinary innovation, creativity, and research through its on-campus and online programs. Jefferson’s online undergraduate programs include bachelor’s degrees in accounting, professional communications and media, and behavioral and health sciences. Students can pursue bachelor’s degrees in niche areas of management such as health services, business, human resources, and information technology. Jefferson also provides bachelor’s degrees in law enforcement leadership and organizational leadership, which are ideal for students who want to pursue executive positions within law enforcement and institutional settings. Online master’s degrees at Jefferson provide business and healthcare professionals opportunities to gain advanced knowledge and skills while continuing to work full time. Jefferson’s online innovation master of business administration (IMBA) encourages business professionals to explore entrepreneurship and dynamic problem-solving with concentrations in business analytics and strategic design thinking. Students can also complete online master’s degrees in sustainable design and construction management. Online master’s degrees in population health intelligence, healthcare quality and safety, applied health economics, and medical disaster management prepare health industry professionals and providers to address issues and problems within subsets of healthcare; programs last one to two years. Jefferson’s online nursing and midwifery completion master’s degrees prepare students for online doctoral programs in the same areas. Jefferson offers an online doctorate in nursing practice to students with bachelor’s or master’s degrees in the field. The online midwifery doctorate includes two to three years of coursework to build advocacy, leadership, and clinical skills among midwifery professionals. An online post-professional doctorate in occupational therapy rounds out Jefferson’s doctoral options. Philadelphia University + Thomas Jefferson University is accredited by the Middle States Association of Colleges and Schools. Programmatic accreditation includes approval by the Commission on Collegiate Nursing Education and the Accreditation Council for Business Schools and Programs. Founded in the spirit of St. John Baptist de La Salle in 1863, La Salle University remains committed to its Catholic traditions. Academic programs and community engagement at La Salle University embrace the school’s Catholic identity while providing students with practical and empowering opportunities to strengthen their knowledge, faith, and wisdom. La Salle University offers three online undergraduate degrees. Registered nurses can complete a bachelor’s degree in as few as 13 months by completing 27 credit hours of core nursing coursework. The online bachelor’s degree in organizational leadership offers business professionals coursework that builds competency in areas such as human resources, marketing, and operational leadership. The online pre-speech language pathology program includes ten undergraduate courses to provide post-baccalaureate students foundational knowledge in communication sciences and disorder theory, as well as practice in anticipation of a master’s degree in the field. La Salle University’s online graduate degrees in information technology management and leadership prepare information technology professionals to advance to administrative and executive positions in the field. La Salle’s nonprofit leadership graduate degree incorporates interdisciplinary coursework to train individuals for leadership positions in the expansive nonprofit sector. Online graduate programs in computer information science and cybersecurity offer professionals within the technology sector a chance to build advanced skills in data analysis and safety. The economic crime forensics degree includes tracks for students who want to focus on corporate fraud or network security. La Salle University’s online master’s in business administration offers specializations in accounting, finance, marketing, management, and business systems. All MBA degrees include between 33 and 39 credit hours of coursework. Students can supplement their graduate degrees and build professional skills through one of La Salle’s graduate certificates. Certificates in instructional technology management, human capital development, fraud and forensic accounting, and cybersecurity consist of 15-18 credit hours. In addition to regional accreditation by the Middle States Commission on Higher Education, La Salle University maintains programmatic accreditation through the Association to Advance Collegiate Schools of Business and the Commission on Collegiate Nursing Education. Initially established as a school of accounting in 1921, Robert Morris University was named for the financier of the American Revolution in 1935. Currently, RMU offers more than 40 online undergraduate, graduate, and certificate programs from its main campus in Moon Township. RMU’s undergraduate programs include degrees in business, computer and information systems, leadership, nursing and health sciences, and social sciences. Online master’s degrees offer working professionals opportunities to build their knowledge and skills in fields such as business, nursing, education, leadership, and engineering. RMU’s online master’s in engineering management includes 30 credit hours of coursework on engineering systems management, interpersonal communication, and leadership in technology settings, while the online data analytics program trains systems analysts and managers to collect, assess, and maintain organizational information. RMU also offers several master’s degrees in nursing (MSN). Registered nurses can go directly into an MSN program, and practicing nurses can specialize in nursing education or nursing administration. RMU also offers a joint MSN-MBA program online. Students in RMU’s online master’s programs in instructional leadership or nursing can continue on to doctoral degrees in the field. RMU offers doctorates in nursing practice to nurses with master’s degrees in family medicine or psychiatric and mental health nursing. Online graduate certificates at RMU provide opportunities for educators, nurses, and working professionals to gain advanced knowledge and skills in their fields. Graduate certificate programs include 9-12 credit hours. Education graduate certificates include programs in online teaching, autism disorders, English as a Second Language, and a principal certification. Leadership certificate programs emphasize ethics and legal studies, conflict resolution and group dynamics, organizational change, and nonprofit leadership. RMU holds accreditation by the Middle States Commission on Higher Education and programmatic accreditation includes endorsement by the Association to Advance Collegiate Schools of Business, the Council for the Accreditation of Educator Preparation, and the Commission on Collegiate Nursing Education. Carlow University in Pittsburgh offers more than 1,300 students learning experiences based in Catholic values. Carlow University’s commitment to its foundation by the Sisters of Mercy in 1929 accompanies the institution’s dedication to academic excellence. Carlow University offers online certificate, bachelor’s, and master’s programs alongside degrees with low-residency requirements. Educators, counselors, and other professionals can earn a certificate in autism spectrum disorders through 12 credit hours of courses on theories, treatments, and behavioral supports for individuals with autism. The online certificate prepares students to obtain an autism endorsement through the Pennsylvania State Board of Education. Bachelor’s programs at Carlow University include business management and health management degrees, as well as an RN-to-BSN degree. Within the business management and health management online bachelor’s degrees, students complete 120 credit hours of general education and major coursework. Adult students and those with previous college credit can transfer up to 88 credits to the degree. All of Carlow’s online undergraduate programs prepare students for graduate degrees. Students in Carlow’s online RN-to-BSN program can complete up to 12 credit hours of graduate work within the bachelor’s curriculum as they prepare for continued study. The online bachelor’s degree in business management includes coursework ideal for students in Carlow’s master’s of business administration program. Carlow’s online MBA includes concentrations in project management, fraud and forensics, human resource management, healthcare management, and leadership. Students complete synchronous coursework in a cohort model, engaging with fellow business professionals and instructors alike. Carlow University also offers an online master’s degree in fraud and forensics, and two online education programs. Educational professionals can earn a master’s degree with a concentration in special education for either Pre-K-8 or grades 7-12. Students can also enroll in an online master’s in nursing program or combine an MSN and MBA for a dual degree totalling 51 credit hours. Low-residency programs at Carlow require students to complete online coursework while attending on-campus learning exercises. The master’s in fine arts in creative writing takes part in four residencies -- two in PA and two in Ireland. The low-residency online doctorate in nursing practice includes two weekend residencies each semester. Carlow University is accredited by the Middle States Commission on Higher Education. The school’s nursing programs are accredited by the Commission on Collegiate Nursing Education and have approval through the Pennsylvania State Board of Nursing. As part of the Conference for Mercy Higher Education, Gwynedd Mercy University traces its origins to the Irish Catholic tradition. Founded in 1948, the university offers more than 40 undergraduate and graduate programs to about 2,100 on-campus and online learners. Online undergraduate programs include an associate degree in business administration and accelerated bachelor’s degrees in business management and healthcare administration. Students can complete accelerated bachelor’s degrees in two years by transferring at least 46 credit hours into the program. Gwynedd Mercy University offers an online master’s degree in mental health or school counseling, and both programs consist of 60 credit hours of coursework and required practicum and clinical hours. Gwynedd also offers accelerated master’s degree programs that students can complete in two years. Accelerated MBA students can specialize in leadership and strategic management, transportation leadership, and healthcare by completing 30-33 credit hours. Education professionals can earn accelerated master’s degrees in curriculum and instruction, special education, teaching, or educational administration. The university also offers an online doctorate in education leadership. Students who have completed doctoral coursework can enroll in the ABD (All But Dissertation) completion program, while those with master’s degrees can participate in Gwynedd Mercy’s executive accelerated doctoral degree. The executive doctoral program includes 54 credit hours of online coursework and three on-campus residencies. Gwynedd Mercy’s online degree in nursing practice also includes on-campus requirements with one executive session upon completion of 39 credit hours of coursework and requisite 400 clinical hours. Gwynedd Mercy University is accredited by the Middle States Commission on Higher Education. Programs offered by Gwynedd Mercy University's Frances M. Maguire School of Nursing and Health Professions are accredited by the Commission on Collegiate Nursing Education. Undergraduate business programs hold accreditation through the International Assembly for Collegiate Business Education. Rosemont College was founded by the Society of the Holy Child Jesus in 1921. The private, Catholic institution encourages students to develop their intellectual, spiritual, and emotional well-being as they pursue one of Rosemont’s undergraduate or graduate programs. Online programs include bachelor’s and master’s degrees, as well as certificate programs. Rosemont's online bachelor's degree in criminal justice includes 120 credit hours of coursework, but students can transfer as many as 84 credits into the program. Online courses last five weeks and are offered through the Moodle Learning Management System. Students can complete online graduate programs at Rosemont in 18-24 months. The online master’s in business administration degree includes 33 credit hours of required and elective coursework. The online strategic leadership master’s degree includes 11 courses plus a thesis and prepares students to be at the forefront of institutional and organizational change. Rosemont's online master’s degree in healthcare administration also consists of 33 credit hours including a thesis course. Rosemont's online master’s in homeland security and emergency management integrates coursework on Catholic social justice with classes that explore the psychology of terrorism, public health issues, and law enforcement protection. Students complete 36 credit hours delivered across seven-week sessions. Online certificate programs at Rosemont augment graduate programs. Students can complete graduate certificates in healthcare administration, entrepreneurship, leadership studies, or forensic counseling. Each graduate certificate includes 15 credit hours to provide professionals with advanced skills and knowledge or to offer introductory information to workers who want to explore and understand new fields of study. Students can complete certificates in as few as six months. Rosemont College is accredited by the Middle States Commission on Higher Education. First a seminary and later a teaching college, Clarion University now offers more than 100 academic programs to upwards of 5,000 undergraduate and graduate students. Online associate and bachelor’s degrees accompany certificate and minor programs to provide Clarion students with flexible, convenient educational options. Clarion University’s online associate degrees in allied health, business administration, criminal justice, early childhood education, and technology give students access to knowledge and skills necessary for entry-level careers. Students can also transfer credits into one of Clarion’s online bachelor’s programs. Clarion offers more than 15 bachelor’s programs in subjects like liberal studies, sociology, psychology, and real estate. The online liberal studies bachelor’s degree offers specializations in women and gender studies, global studies, communication, community service, English, and library and information science. Students can also pursue an interdisciplinary liberal studies degree tailored to meet their individual interests and educational goals. Through the liberal sciences program, students can complete online minors in history, psychology, information systems, and data analytics. Registered nurses can pursue an online bachelor’s degree in nursing at Clarion. The RN-to-BSN program accepts transfer credits and builds nursing practice while setting the foundations for continued study. An additional online bachelor’s program offering is the medical imaging sciences degree. Students complete 60 credit hours of general education and science coursework before taking two years of major-specific classes. Specializations are available in ultrasound or radiologic technology. Online certificate and endorsement programs in education, public relations, and behavioral analysis increase competencies in curriculum development, gifted education, online instruction, and concussion management. Students can also complete pre-MBA and post-baccalaureate CPA certificates to prepare for future degree and career opportunities. Clarion University maintains accreditation through the Middle States Commission on Higher Education. Programmatic accreditation includes approval from the Accreditation Commission for Education in Nursing. Established as a Baptist seminary in 1924, Eastern University added college classes in 1932. Through the 20th century, Eastern University offered seminary and college coursework to undergraduate, theology, and graduate students on campus and through online programs. Eastern University offers undergraduate programs to working adults who want to earn a degree in an accelerated format. Degrees in liberal arts, business administration, and organizational leadership last two years after transfer credits are applied. The online adult undergraduate youth ministry program requires students to attend a short on-campus residency. Eastern University also offers an online RN-to-BSN program for registered nurses working in the field. Online master’s degrees in education, counseling, nursing, and business provide working professionals opportunities to expand the knowledge and skills pertinent to their current roles. Master’s degrees in special education, multicultural education, and classical education accompany a doctorate in education in curriculum and instruction with a STEM focus. The master’s degree in classical education and doctorate in education require students to participate in on-campus residencies. Eastern’s graduate programs in seminary studies also require students to attend on-campus residencies. Master’s degrees in theological studies are offered to both English and Spanish speakers, and the online doctor of ministry through Eastern’s Palmer Theological Seminary includes 36 credit hours and takes three years to complete. Students can specialize in personal and spiritual transformation, religion and public policy, or prophetic teaching and preaching. Online master’s in business administration degrees at Eastern offer specializations in management, health administration, and social impact. The social impact program requires an on-campus residence, as do Eastern’s online master’s degrees in urban studies and managerial leadership. Doctoral programs in organizational leadership and marriage counseling similarly require students to attend sessions on campus. In addition to regional accreditation through the Middle States Commission on Higher Education, Eastern is a member of The Association of Theological Schools in the U.S. and Canada. Programmatic accreditation includes approval by the Masters in Psychology and Counseling Accreditation Council and the Commission on Collegiate Nursing Education. As one of the founding members of the Council for Christian Colleges and Universities, Geneva College offers more than 100 academic programs infused with scriptural values and Christian devotion. Geneva encourages moral discipline, a personal union with Christ, and the universality of Jesus in all things. The college's online programs offer adult students undergraduate degrees that can be completed in as few as 16 months. Bachelor’s programs consist of 120 credit hours, but students can transfer prior credits for much quicker degree completion. Geneva’s online bachelor of professional studies in aging services trains students to work with aging populations in residential locations, healthcare organizations, and wellness programs, while the bachelor’s program in child and family services provides skills and knowledge for bringing about positive change to individuals of all ages. Geneva provides human services, management, and organizational leadership bachelor’s degrees online for those who want to master aspects of business, government work, or nonprofit sectors. Students gain problem-solving and communication skills applicable to companies and workplaces while applying Christian thought to organizational contexts. Geneva’s online master’s degree in public relations emphasizes integrity and ethics in professional communications as students train in the effective use of verbal, written, and digital communication tools and techniques. The online bachelor’s degree in criminal justice similarly provides learners opportunities to explore theories and practices of law enforcement, the criminal justice system, and corrections while integrating faith and spirituality. Geneva also offers an online associate degree in general studies. The associate program includes 60 credit hours of core coursework in English, social science, humanities, math, and the Bible. Geneva’s online associate degree credits can easily transfer to one of the school’s online bachelor’s programs for continued study. Geneva College is accredited by the Middle States Commission on Higher Education. Founded in 1899 by the Church of the Brethren, Elizabethtown College was dedicated to free expression, civic engagement, and peace and justice from its earliest days. Through its on-campus and online programs, the institution remains dedicated to its foundational values. Elizabethtown College’s School of Continuing and Professional Studies offers undergraduate and graduate programs online for adult students. Bachelor’s degrees in business administration, health services, criminal justice, and healthcare administration include comprehensive liberal arts coursework blended with major-specific classes. The online bachelor’s degree in business administration prepares students for managerial and leadership roles in global business contexts, while the healthcare administration programs incorporate business content with healthcare policy and practice expertise. Students pursuing the online bachelor’s degree in human services study a comprehensive curriculum with coursework on theories and practices in human and societal issues. Students can also focus their undergraduate human services degree in behavioral and addictions counseling. The criminal justice program includes a similarly broad collection of classes to provide students with general knowledge of law, law enforcement, and criminal justice while simultaneously offering insights into niche aspects of the field. Elizabethtown’s online master’s in business administration offers concentrations in healthcare administration or strategic leadership, both of which can be completed in two years. A graduate certificate in both healthcare administration and strategic leadership are available as well. Certificate programs include 12 credit hours of coursework. Elizabethtown College maintains regional accreditation through the Middle States Commission for Higher Education and programmatic accreditation from the Accreditation Council for Business Schools and Programs. Point Park University fosters diversity, innovation, and integrity at its urban campus in the heart of Pittsburgh. Through academic programs offered by the university's schools of performing arts, business, arts and sciences, and communication, Point Park University provides students with access to more than 75 undergraduate majors, 21 graduate degrees, and 20 online programs. The university's online bachelor’s programs include degrees in business management, with concentrations in entrepreneurship and management. Online students can also enroll in bachelor’s degrees in public administration, with specialized curricula for emergency medical service administration and fire service administration tracks. The online bachelor's degree in interdisciplinary design provides students a chance to design a degree that best meets their interests and future goals. Additional online undergraduate degrees are offered in public relations and advertising, criminal justice, information technology, and a unique online program in writing for screen and media. The bachelor’s in writing for screen and media trains students to write for a variety of mediums, including film, television, video games, and other online platforms. All undergraduate degrees include 120 credit hours of coursework, and transfer options allow students to complete programs in 2-4 years. Graduate programs at Point Park University include education degrees in athletic coaching and special education. Master of arts degrees in educational administration, curriculum and instruction, and adult learning offer education professionals further opportunities to expand their knowledge and skills within the field of teaching, instruction, and learning. The university also offers online graduate certificates for educators who want to advance to superintendent or principal roles. The communication technology degree builds on the school’s undergraduate programs in media writing and public relations, with concentrations in social media and applied practice. Business, healthcare, and technology professionals can enroll in online master’s in business administration, healthcare administration, or intelligence and global security programs as well. Degrees consist of 30-36 credit hours of coursework that students can complete in 1-3 years. In addition to regional accreditation through the Middle States Commission on Higher Education and programmatic accreditations by organizations including the International Assembly for Collegiate Business Education, Point Park University participates in the National Council for State Authorization Reciprocity Agreements. Below you’ll find another list of the top colleges in Pennsylvania, this time sorted by tuition rate. 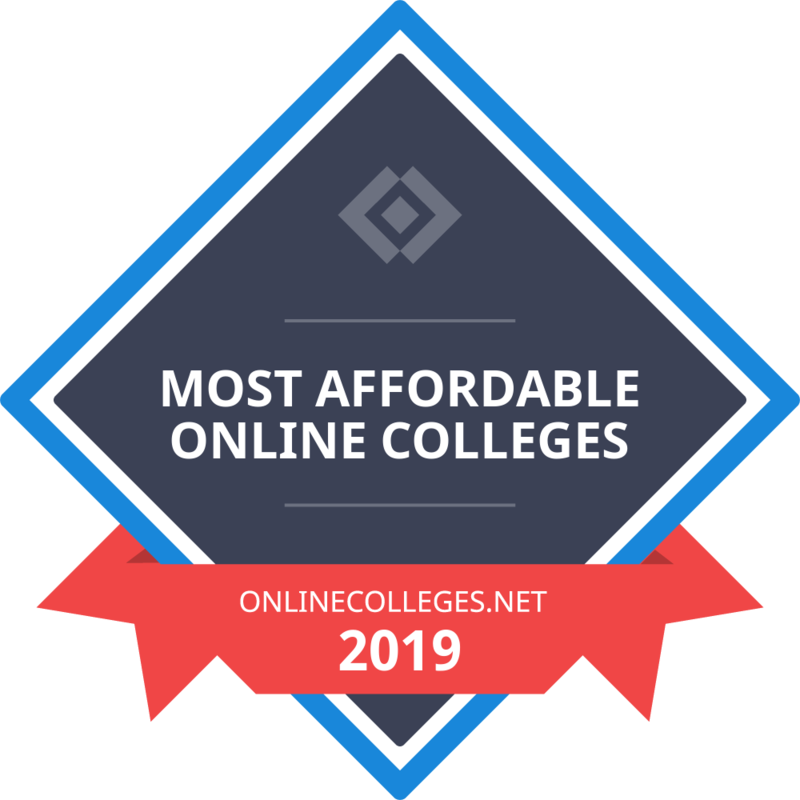 Our list of the most affordable online schools in Pennsylvania is based on in-state yearly tuition, or annual tuition rates if a school does not differentiate between in-state and out-of-state students. Tuition rates are based on a full course load each semester or term. All colleges on the list offer at least one bachelor's degree completion program available entirely online. 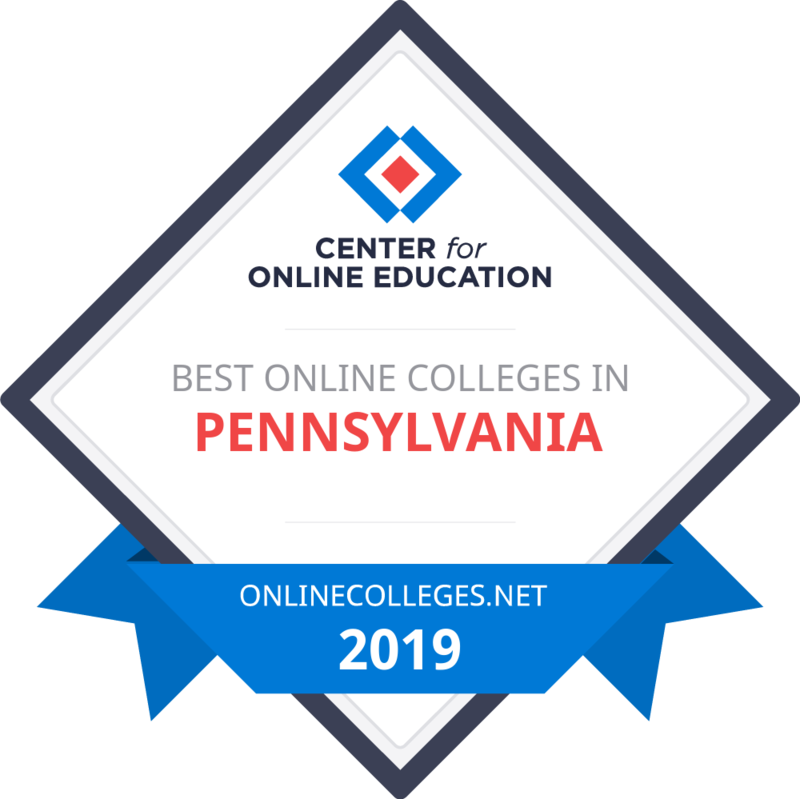 The online schools in PA with the lowest tuition are ranked highest, providing prospective students with a true list of the most affordable online colleges in their state. Graduates of online schools in Pennsylvania will enter a healthy job market in the years to come. As of May 2018, the state unemployment rate was 4.5%, only slightly above the national average. Pennsylvania workers make an annual median wage of about $48,760, with those in management occupations taking home $123,380 per year on average. Some of the greatest employment growth in recent years has come in mining and logging, construction, business and professional services, and education and health services. The leisure and hospitality sector has also experienced steady growth. Several specific careers have rapidly risen in demand and popularity, according to the career aggregation publication Zippia. Many of these jobs — such as occupational therapists, home health aides, and nurse practitioners — fall under the healthcare industry. Others — including interpreters, web developers, and biological engineers — span a variety of sectors. In short, college graduates can find numerous career options in an increasingly dynamic state economy. In formulating this list, Zippia gathered data from each state and territory to create what it calls a “master database” of career data and information. It then analyzed all Pennsylvania occupations projected to have a minimum of 1,000 employees in 2024, ranking them from one to 437. The table below includes the top five occupations. $10,000; Applicants must be sophomore students attending a life science program through a college or university in Pennsylvania. Additional requirements include a minimum 3.0 GPA and status as a U.S. citizen or legal resident. $5,000; Candidates must be Pennsylvania high school seniors planning to attend college. Students should have a minimum 3.0 GPA to apply. Up to $4,378; This program assists Pennsylvania residents pursuing a degree related to energy, diverse manufacturing, or agriculture. Candidates must hold a high school diploma or GED and enroll in a PHEAA-approved postsecondary institution. $3,000; This scholarship helps graduating seniors in Allegheny, Armstrong, Butler, Beaver, Fayette, Washington, and Westmoreland counties. Recipients should major in an environmentally related field. $3,000; This scholarship provides funding to Pennsylvania residents who demonstrate commitment to living spiritual life. $2,000; Candidates must be Pennsylvania residents with a minimum 3.6 GPA and a 1300 SAT score in reading and math. Amount varies; Applicants must be high school graduates, enroll in a PHEAA-approved college or university, and attend school at least half time. $1,000; This fund assists active duty service members, veterans, and military dependents who reside in Pennsylvania. Applicants must enroll in a nursing program. Award varies; The Pennsylvania Higher Education Assistance Agency issues this grant to children of deceased police officers, firefighters, emergency responders, or National Guard members. Applicants must be under the age of 25 and enroll in a state college or university.